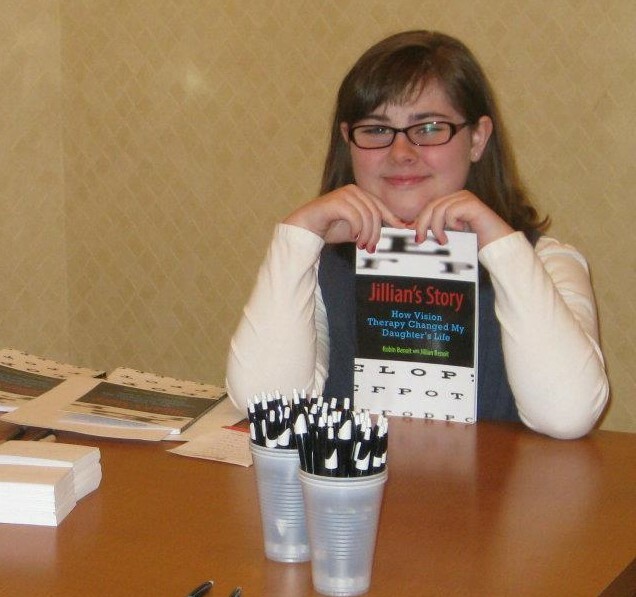 Jillian's Story | Telling the world, one blog at a time, how vision therapy changes lives. Telling the world, one blog at a time, how vision therapy changes lives. She and her husband were the first to arrive. She sat on the second row. She held a notepad in one hand and a pen in the other, balancing a copy of Jillian’s Story on her lap. I had never met her and did not know her name. We had never spoken a word to each other and yet, I knew her. This was a mother looking for answers for her troubled child. I would venture to guess that we had asked the same questions of teachers and doctors and endured a similar number of sleepless nights. She had come to the event in search of hope and I wanted, more than anything, to give it to her. 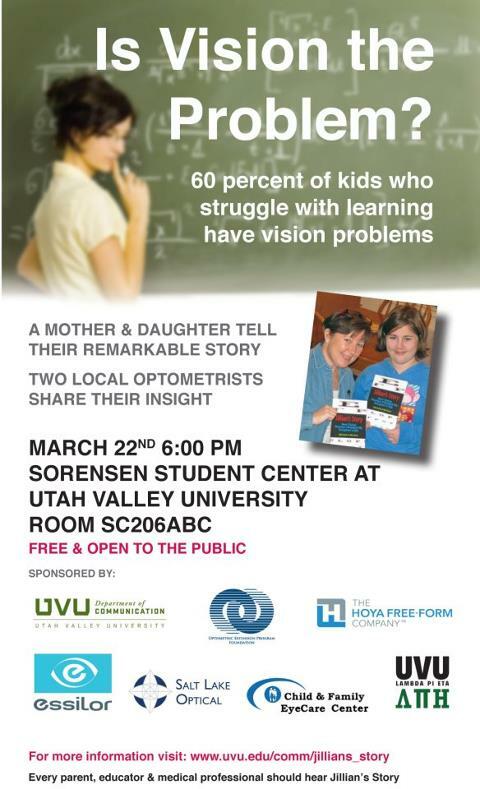 Thanks to the terrific efforts of marketing students at Utah Valley University and the Optometric Extension Program Foundation (huge thanks to Kelin and Matt Kushin), Jillian and I found ourselves in Utah that night for the first time. These students had selected Jillian’s Story as their entry for Google’s Online Marketing Challenge. They sought the support of the OEPF, allowing them to enter the non-profit category. As part of their campaign and with the support of wonderful sponsors, they were able to organize and promote our speaking engagement well beyond the college campus. As I shared Jillian’s journey that night, my eyes were repeatedly drawn to the woman on the second row. She cried almost the entire time. Jillian shared the vision therapy success stories of other children. She told the audience about Mackenzie, Sydney, Ryan, Will and Zach, five kids whose lives have also been changed thanks to optometric vision therapy. I glanced at one point toward the second row and was thrilled to see tears were turning into smiles. Worry was turning into hope. Jillian and I were fortunate to have the assistance of Drs. Robin Price and Jarrod Davies of the Utah Vision Development Center. Jillian is still talking about the time she spent earlier that day in their center “playing” with all the vision therapy equipment. She was especially drawn to the 3D big screen monitor and its game-like challenges. Drs. Price and Davies were kind enough to bring equipment to the presentation. With Jillian’s help, they demonstrated a few vision therapy exercises, even getting the audience in the act by having them use a Brock String. Doesn’t this sound familiar? I have read these same words countless times in emails from parents who have read or heard about our book. I gave her a hug and she whispered in my ear, “I think you are the answer to my prayers.” I found myself choking back tears. She promised to keep in touch and I hope to report great success for her son. I know vision therapy will change his life and, by way of changing his, it will change hers as well. I just know! The First Blog: For The Life Changers! I wish there was a word bigger and more special than “thank you.” I know you can say, “thank you so much,” which is a little more gracious. But what word or phrase is appropriate when you wish to thank someone for changing your child’s life? There are no words. A few months ago, Jillian and I had the chance to say thank you in person to a large group of optometrists and vision therapists at their annual meeting. I was thrilled to speak to those who have gone above and beyond to become developmental optometrists and vision therapists. They are members of the College of Optometrists in Vision Development (COVD –www.covd.org). The name is a little confusing as it’s not a college in terms of a university campus, but an association of advanced, specialized vision care professionals. Jillian was there as a surprise to all but a few people. She was given a “student” nametag and sat in the middle of the audience without anyone realizing her true identity. I kicked off our presentation with a huge slide that said, “Thank You.” These professionals change lives for the better, sometimes quite miraculously, and I wanted to express my gratitude and admiration for their work. 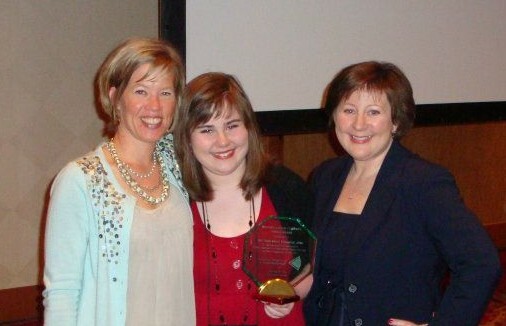 I introduced Jillian and her wonderful vision therapist, Lindsey Hebert, about half way into the presentation. It was a great surprise to the crowd. Jillian and Lindsey shared the vision therapy success stories of four children Jillian had come to know via e-mail. Jillian and I followed their progress through vision therapy and celebrated with them along the way. We cheered for them as they made straight A’s, hit a baseball, rode a bike, and discovered a love of books. And, on behalf of these children, Jillian expressed her thanks for the changes in their lives. And yet, it didn’t feel adequate. I still felt as if “thank you” just wasn’t big enough. The day after our speech, I noticed a gentleman standing at a slight distance from our book signing table. He seemed to be waiting for someone. After standing there for several minutes, he came over and shook our hands. He told us that he was the optometrist of one of the success story children Jillian had mentioned in her speech. Jillian jumped out of her seat, bolted around the table and came to stand in front of him. She told him, without even taking a breath, that because of his vision therapy program, her friend can now play soccer, ride a bike, make good grades and finish homework while it’s still light outside, which (she pointed out to him) is really important for kids who like to ride bikes and play soccer. Then, she threw her arms around him in a huge bear hug. She looked up at him with her eyes shining, a darling smile on her face, and said, “Thank you for everything!” The man was fighting back tears as he hugged Jillian, looking over her head at me. He gave me a quick nod and turned to leave and I knew that he felt Jillian’s appreciation all the way to his bones.